There's a lot of talk in social media marketing circles about Facebook native video - how Facebook native video is generating the best reach of any content on the network, how Facebook native video has overtaken YouTube as the main source of video content on The Social Network. But what about native video on other platforms? What about native videos uploaded to Twitter - are they also performing better than posted YouTube links? The answer, according to a new report from social analytics firm Socialbakers, is yes. 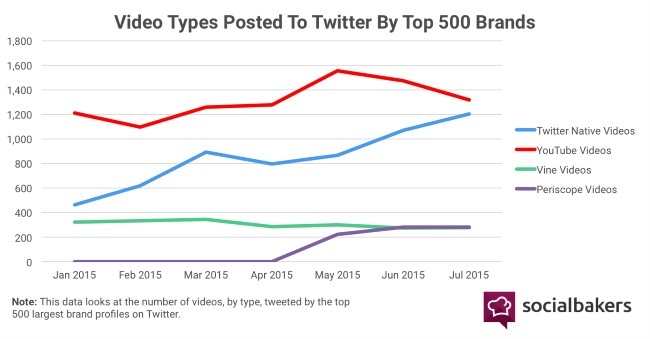 Socialbakers analyzed the video links posted by the top 500 largest brand profiles on Twitter, from January to July, and found that natively posted Twitter videos are closing in, and set to overtake YouTube links on the network very soon. Socialbakers also found (as above) that brands are now posting more video content from Periscope than they are from Vine, which is pretty amazing, considering Periscope had only existed for four months within this period of measurement. The finding underlines the potential of live-streaming, and that brands are using this new medium to boost their brand message. While the rise of Periscope content could also be attributed to the app's 'newness' by comparison to Vine in this report, the fact that that growth has been sustained goes some way to explaining why social platforms are so keen on live-streaming as a new content option. But even more important than both these findings, Socialbakers also found that natively posted Twitter video is generating way more engagement on the platform than any other video content. This makes sense - more interactions with natively posted video content likely means more brands are going to post native video, so the former fuels the latter, giving us some explanation behind the growth of natively posted Twitter videos. But it also means brands have another element to factor in to their video content strategies - while brands should be uploading their video content direct to Facebook to maximize reach potential on The Social Network, they should also be doing the same for Twitter, as native Twitter video is also performing better and getting better reach (through interaction). 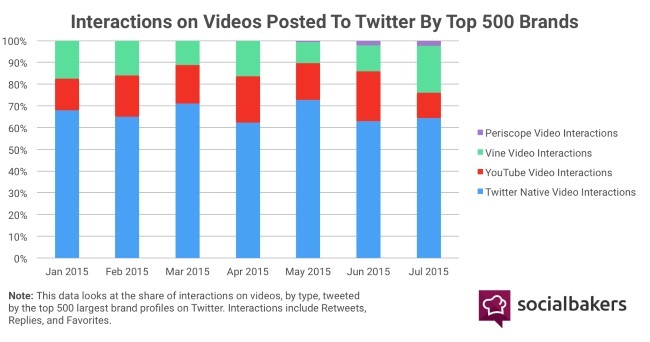 Also interesting, there was a big boost in Vine video interactions in July. ReelSEO, which tracks the performance of the top Vine users, made specific mention in their July 2015 report of the growing number of Vine influencers who are working with brands - among them is Logan Paul, whose most popular Vine in July was this one (which has been viewed more than 34 million times). The rise of Vine influencers working with brands is no doubt a contributing factor in the increase in Vine video reactions among video content posted by the top 500 brands - it'll be interesting to see if that number increases in coming months, as it will too with Periscope. So what does this mean for your video marketing strategy?